Why Choose a New Furnace That Uses Heating Oil? 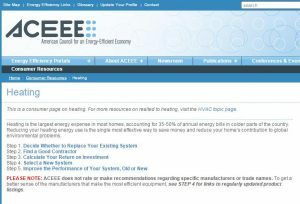 You are here: Home / HVAC Info & Articles / Articles / Why Choose a New Furnace That Uses Heating Oil? Old gas furnace without vent dampers or an induced draft fan (which limit the flow of heated air up the chimney when the heating system is off). If your furnace or boiler is 10–20 years old, and you are experiencing discomfort or high utility bills, hire a highly-qualified home performance or heating contractor who can help you evaluate your existing system. Often it will be more cost-effective to improve house insulation and air-tightness, repair or insulate ductwork, or tune up your system before purchasing a new one. With all of the available options out there, it’s time to narrow down your choices. For the hottest heat available, we recommend a heating oil furnace, which has 140,000 British Thermal Units (BTU’s) per gallon. This type of system heats faster than gas furnaces, reducing the total amount of fuel that will burn. When comparing BTU’s, note that one BTU of oil burns less pollutants than one BTU of natural gas, making it a clean choice for your home. On cold, freezing mornings, your oil furnace will heat up quickly and bring comfort to your home in a safe way. If you have an idea of how much it will cost to install a new system, use the chart below to calculate how much money you are likely to save each year with a more efficient system, and what your return on investment is likely to be. Remember, when fuel prices go up, your savings will go up. To determine savings from the table to the right, find the horizontal row corresponding to the old system’s AFUE, then choose the number from that row that is in the vertical column corresponding to the new system’s AFUE. That number is the projected dollar savings per hundred dollars of existing fuel bills. 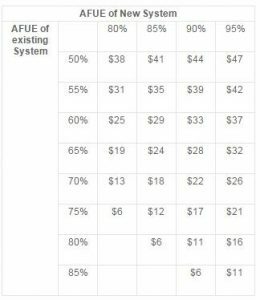 For example, if your present AFUE is 65% and you plan to install a high-efficiency natural gas system with an AFUE of 90%, then the projected saving is $27 per $100. If, say, your annual fuel bill is $1,300, then the total yearly savings should be about $27 x 13 = $351. There are new dual fuel furnace options available today, so you can have flexibility and benefit from getting heat from a heat pump when temperatures are more moderate and an oil burn when temperatures go below freezing. At Berico, we sell heating oil to our Greensboro and High Point clients. Call 336-273-8668 today for more information on oil furnaces and heating oil. https://www.berico.com/wp-content/uploads/2018/12/header-logo-new-3a.png 0 0 berico_admin https://www.berico.com/wp-content/uploads/2018/12/header-logo-new-3a.png berico_admin2014-10-27 06:31:192017-11-01 17:54:44Why Choose a New Furnace That Uses Heating Oil?